With elmah.io Error Monitoring, all errors on your websites are automatically synced to elmah.io’s powerful infrastructure in the cloud. 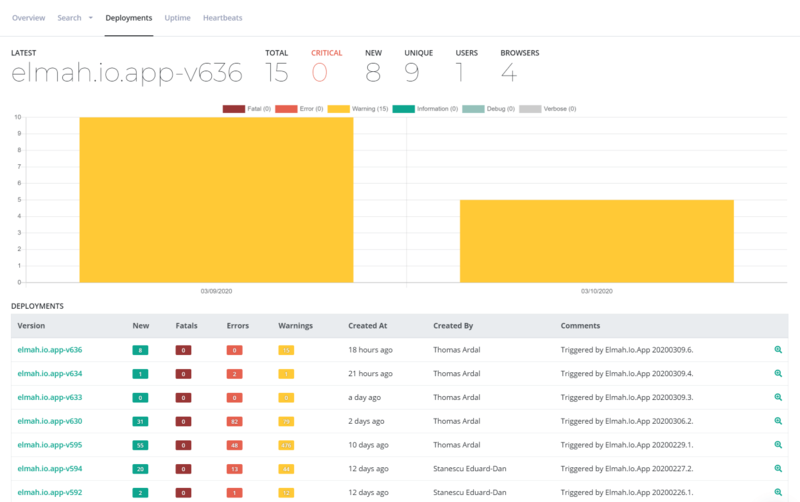 Using a range of different dashboards, it is easy for you to monitor the current state of your applications and react as soon as something breaks down. You can track both a single application as well as get the full picture of all applications, using a range of interesting metrics. Integrations with popular instant messaging and issue tracking systems, reduce the time from introducing an error to deploying a fix in production. elmah.io Uptime Monitoring continuously pings your endpoints from 5 different regions. When your endpoints start failing, errors are logged in your existing error logs. This means that all of the rules and notifications already set up just work. No need to maintain your team and notification rules in multiple tools. Uptime checks also validate your SSL certificates and domain names, giving you a chance to renew both before users start experiencing errors in their browser. Deployment Tracking gives you a perfect overview of the different versions of your software. New versions of your software are automatically registered by elmah.io. Metrics about the performance of each release is collected immediately. Being able to determine if a new release introduced bugs, will allow for quick fixing or rollback to a previous version. 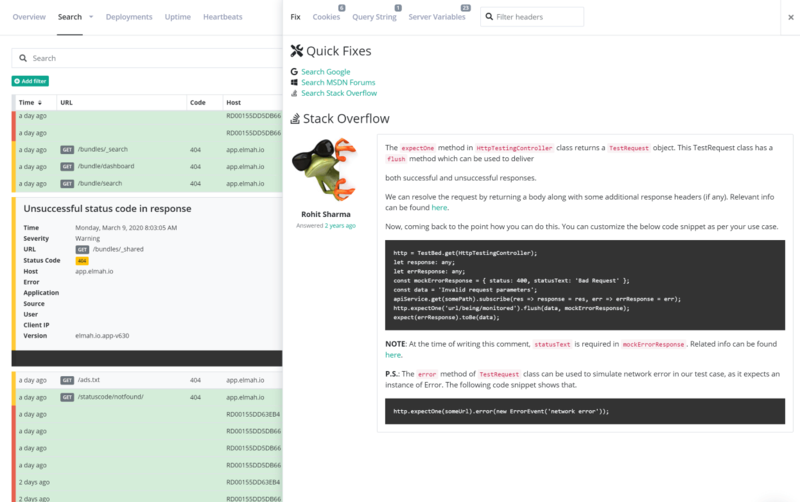 Deployment Tracking supports all of the popular deployment choices on the market, like Azure DevOps and Octopus Deploy. 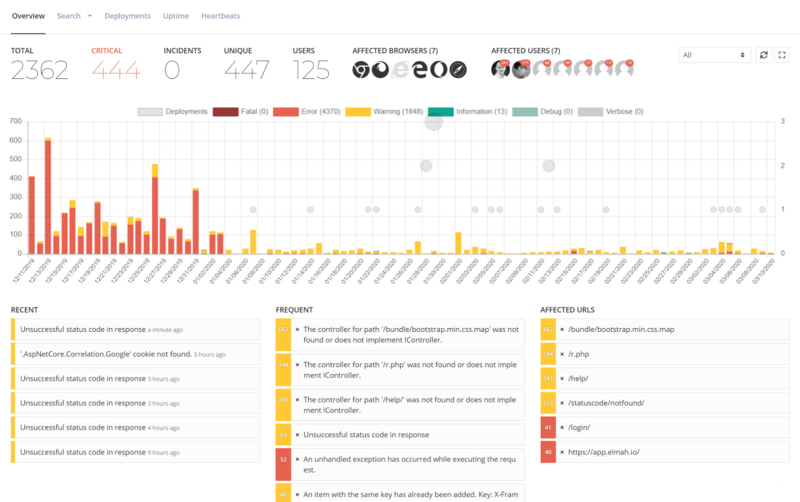 By collecting all error logs in one place, elmah.io has given us a much better insight into our applications. We use it all the way from the development to production environments and by doing so it's hard not to catch errors before they go live. A huge plus is that it works with any popular logging framework and isn't limited to ELMAH. Getting started is easy and adds no development overhead - it just works. If it for whatever reason doesn't, then the support is very quick to reply and happy to help. elmah.io has been an important part of our process over the past two years. We first used it as a trial for an internal API to help with debugging. The ease of use won the whole team over and elmah.io quickly became the de facto choice for all production projects at Rosslyn Analytics. elmah.io's web interface makes it accessible for not only developers but also project managers and testers, especially for a distributed team like ours. It facilitates the flow of information and saves us plenty of development time in the process. 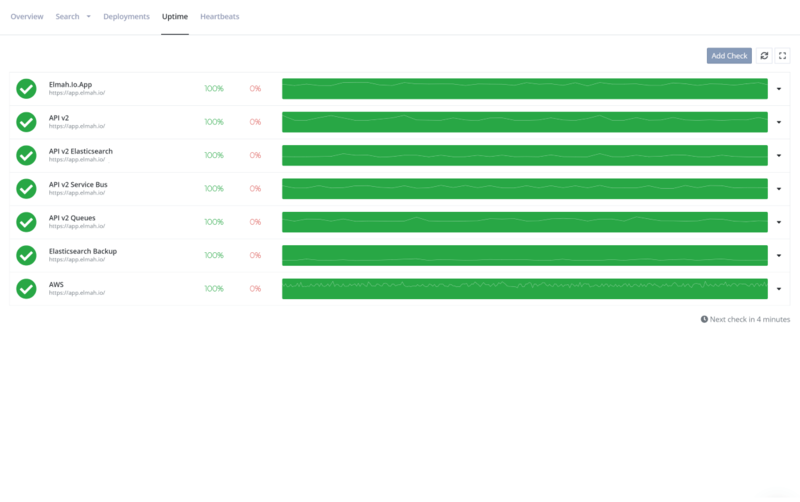 Keeping track of issues in a micro-service architecture can be tricky, but elmah.io makes it easy for us by providing a centralized dashboard with real time stats for our multiple apps. When we see issues pop up, being able to quickly see how recurrent a particular error is over time with elmah.io's graphs help us identify urgency. We've never had uptime issues with the SaaS offering and are overall very happy with elmah.io and the level of support. We use elmah.io across all our projects at The Cogworks. We became familiar with it when one of our existing projects was causing us performance issues. 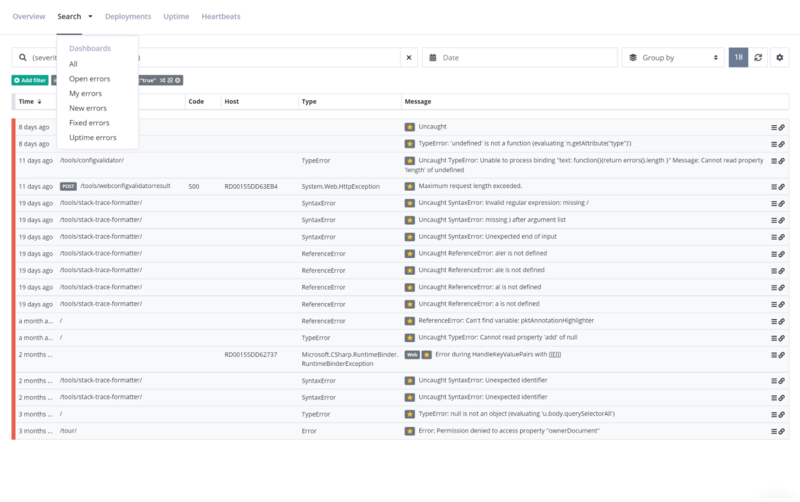 Trawling through our application and IIS logs we had found nothing of note but when we installed elmah.io it opened up a whole new window to our site code base. We soon found the problem and all was fixed. 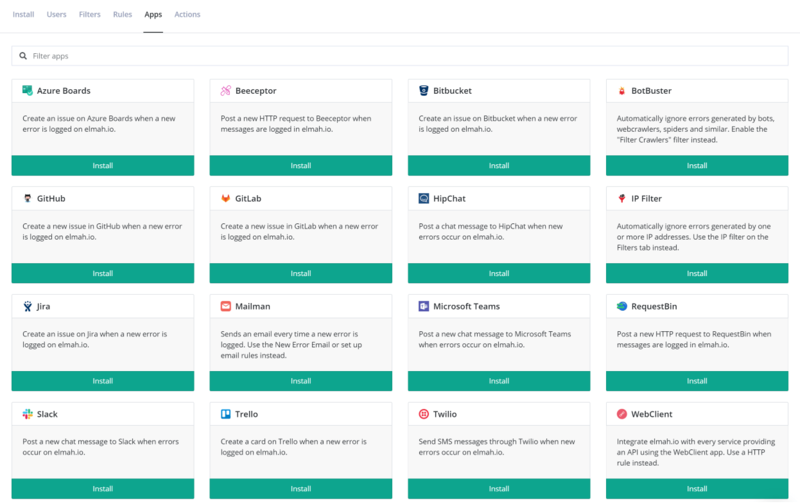 Now after working with it on an ongoing basis, what we really like is the slack integration that acts like an early warning system. Now it’s a case of how did we ever live without it? I've been working with elmah.io for a little over a year now in a .NET Core Lambda environment. Their logging offerings are well-featured, easy to implement, and a fraction of the cost of their competitors. On top of their great products, their support team has been top-notch. On multiple occasions, I've had the opportunity to directly work with one of their developers to help solve my issues or concerns. I would gladly recommend elmah.io to anyone who wants to untangle their logging environment. I have used the standalone ELMAH for a decade. It's a great standard for handling errors, but it's a pain to setup the DB logger. It required constant attention, and the only tool to search the data is manual SQL statements. elmah.io makes it incredibly simpler to setup and incorporate ELMAH into your projects. It is remarkably stable, and the UI is much more than a simple list of errors. elmah.io provides the most amazing UI to slice and dice the data as an analytics server. I see it as an invaluable tool to provide a high-quality product at neuroticmedia.com. We all know that elmah.io is invaluable in simplifying website monitoring & error logging, but their other great strength is the level of engagement and support that they offer. I don't think I've ever waited more than 5 minutes for Thomas to respond to a query, regardless of time of day. I was once on a river in Borneo when my phone happened to locate a weak 3G signal and inform me of an overflowing elmah.io log. I managed to send out a quick S.O.S to Thomas, who (within minutes) very graciously extended our message allocation until I could return home and take proper action. I look forward to using elmah.io for many years to come.